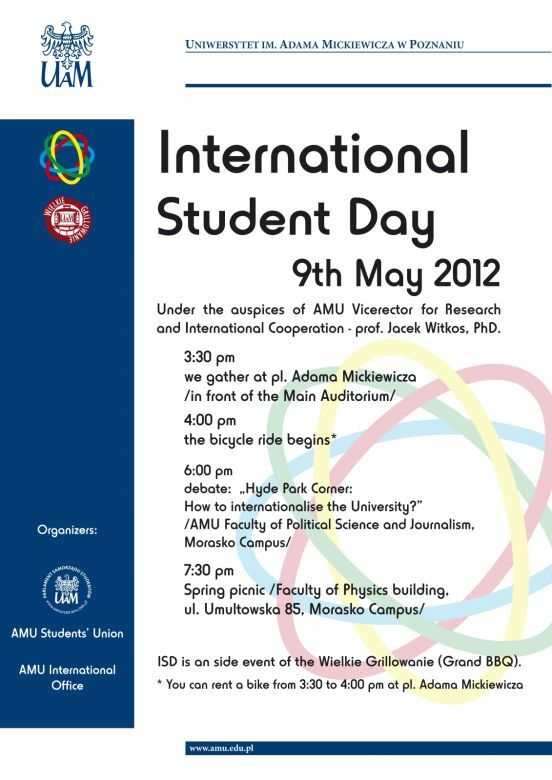 International Student Day is an event taking place during the first day of AMU’s Grand Barbecue! It all started a few years ago when a student came up with an idea to make AMU’s Grand BBQ a bit more… international. That’s why we would like to invite you all to participate in all the attractions that we’ve prepared for you on May 9th, the day organized especially for you, International Students! First of all, you will have the unique opportunity to join other students in their bike ride from the center of Poznań straight to Campus Morasko – this trip will make you feel relaxed and let you feel it in the air that AMU’s Grand BBQ is about to GO OFF! Right after you arrive on your bikes (or on the bus, on foot – whichever suits you best!) on Morasko the most important event for you as International Students will begin – an invigorating debate “Hyde Park Corner: How to internationalise the University?” in the building we all know, the Department of Political Science and Journalism. There will be many great people participating in the debate – people in charge of the university, working with you everyday… Those fantastic people who help you with your doubts when you arrive in Poland and then solve every issue that turns out to be problematic for you during your stay. During the debate you will be able to speak up, to say what’s most, uppermost on your mind about the organization of teaching, living conditions, teaching quality etc. Then you will have a possibility to ask the heads of the University what is going to change, what is not, what they are planning on in the next couple of years… The floor will be yours! But, of course, that’s not all! A BBQ is after all about… eating! And that’s what we’re going to do after our successful debate – we are going to eat as much as we can and make as many new friends as possible because that’s what this day is supposed to be about! At the end of our International Student Day, you will receive a small gift so that you remember this amazing day every time you look at it. And when this is done, there will be only one thing left – to sing and dance with all the other students during the concerts! So, remember, join us and let’s have loads of fun together!